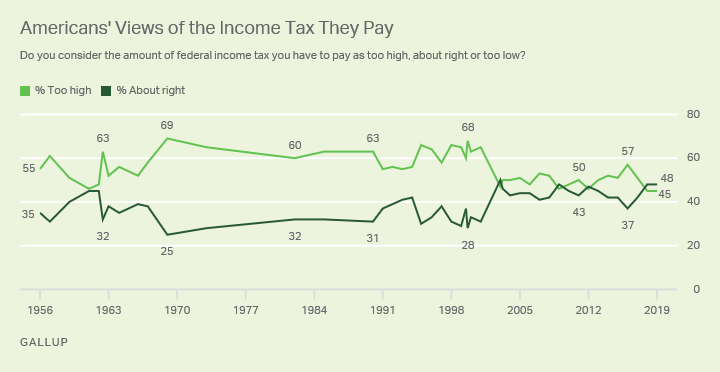 CONVERSABLE ECONOMIST: US Attitudes Toward Federal Taxes: A Rising Share of "About Right"
What's interesting to me here is that from the late 1960s up through the 1990s, a healthy majority of Americans consistently viewed their income taxes as too high. But since around 2000, the gap has been much narrower. 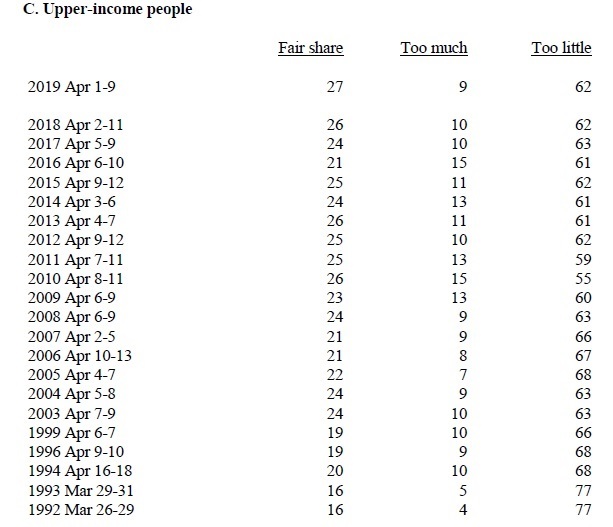 Indeed, the share of Americans saying that their income taxes are "about right" has been at its highest historical level in 2018 and 2019. 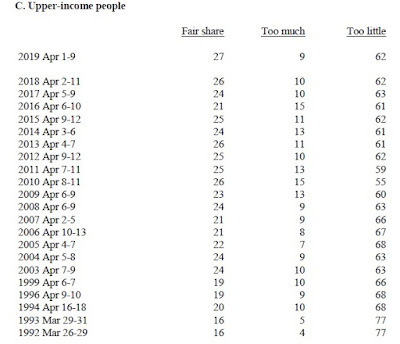 What jumps out at me is that the proportion saying that upper-income people are paying a fair share of federal taxes was at its highest ever in 2019, while the share saying that upper-income people are paying "too little" was at its lowest ever. Yes, there's still a majority saying that upper-income people are paying "too little." But it's a shrinking majority. Given trends toward greater inequality of incomes over the 25 years shown in the table, I wouldn't have expected that pattern. 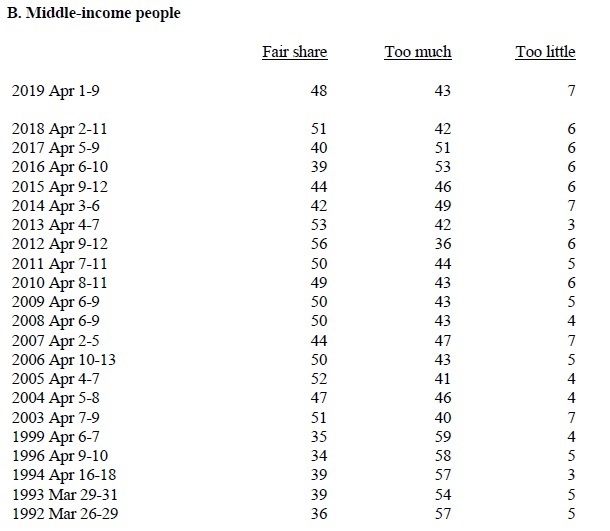 Here, you can see the pattern from the figure above: that is, the share saying that middle-income people pay too much is falling, while the share saying that they pay their fair share seems to have risen over time. Of course, questions about whether a tax code is fair are going to be influenced by political partisanship. For example, here are some poll responses from the Pew Research Center. Their polling shows that the share of American thinking the federal tax system is very or moderately fair rose overall slightly in the last year overall. However, this modest overall rise is a result of Republicans being much more willing to say the tax system is fair than at any time in the last 20 years, and Democrats being much less willing to say so. As I've pointed out in the past, poll responses on economic questions like whether free trade offers benefits are also influenced dramatically by political preferences. During the past couple of years, as President Trump has inveighed against international trade and called for protectionism, Democrats have suddenly become much more positive about trade. One suspects that this pattern emerged more from anti-Trump feeling than from increased time spent reading economics textbooks. 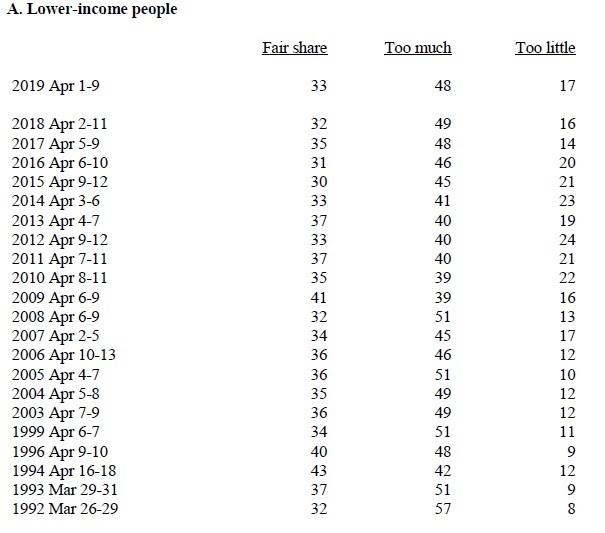 Still, it's interesting to me that a plurality of American now see the federal income tax as "about right," while the proportion saying that upper-incomes pay too little is down, the proportion saying that middle-incomes pay a fair share is up, and the proportion saying that lower incomes pay too little has risen. 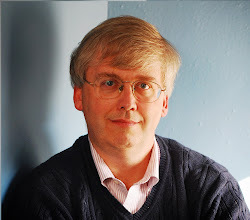 Perhaps politicians who call for cutting taxes, or for dramatic tax increases, are refighting battles from the 1990s that are of less relevance to current voters.